Musicals – and not least musical biopics – are a pretty big deal at the movies right now. While you could argue that the musical never really went away, there’s no doubting its popularity right now, following the box-office storming likes of Bohemian Rhapsody, The Greatest Showman, A Star Is Born and La La Land. 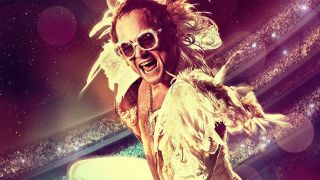 Next up is Elton John biopic Rocketman. The film is directed by Dexter Fletcher (who completed work on Bohemian Rhapsody after Bryan Singer’s exit), and stars Taron Egerton as the artist formerly known as Reginald Dwight. Jamie Bell plays his songwriting partner Bernie Taupin, and Richard Madden is Elton’s manager, John Reid. Rocketman opens in the UK on May 24, 2019, and in the US on May 31, and you can read more about it in the latest issue of Total Film magazine, which hits shelves this Friday, April 5. It’s a huge Avengers: Endgame special, and features loads more including Toy Story 4, Olivia Wilde and Men In Black International to name a few. Check it out!